A shocker during Khader’s surprise visit to Kundapur govt hospital! 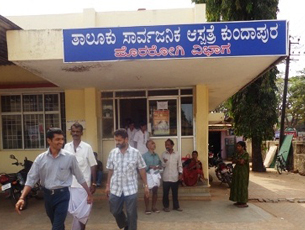 Kundapur, Oct 12, 2014: In a rather interesting case mirroring the glaring apathy of the doctors and staff at the Government Hospital at Kundapur,none were aware that one of the patients was lying dead on his bed until Health Minister UT Khader who was on a surprise visit to the hospital noticed it. Khader had paid a surprise visit to the hospital on October 11, Saturday night when the incident took place. The minister after talking to the hospital doctors and staff visited the ward on a request from locals. The minister who went around the ward noticed that a patient named Seena Ganiga of Vinayaka Kodi lying motionless in one of the beds. The minister immediately asked the doctors to check his pulse when it came to light that he was dead. Sources said even the duty doctor Anita failed to give a satisfactory reply to various questions of the minister. The minister said the better equipped hospital with enough staff, however suffered due to the apathy of the hospital staff and directed them to discharge their duties diligently.